It is high time that either ISRO or the state builds an airport at Sullurpeta, the small town near SHAR. It would save a lot of time in transporting satellite payloads from Bangalore. I would think that a convoy travelling at 10mph is going to create congestion on the roadways during its 34 hour trip. ISRO also needs a runway for the landings of RLV-TD which could be at SHAR if deemed safe. Chennai is not far .. If possible they would have flown chartered flights TRV-MAA all these days. RLV Landing strip currently being used in US is 4kms+ long, made of special high friction concrete about 15in thick. Or re-purpose an airfield north of Chennai for ease of access. That will keep the S'kota island clear for developmental flights - RLV, etc. Sholavaram is a good candidate - north of the city, just off NH-5, only 80km away from the island. Been looking forward to Mk III launch for sometime. Anything on why taking so long or why the delay? Cryogenic performance issues or new things to work on discovered!! The GSLV Mark 3 is now scheduled to launch in the first week of June. It's infuriating, because they first announced December 2016 with certainty, then postponed it slightly to Jan 27, then to March, to April, May, finally June. Perhaps the problem lies in the cavalier publicity division of ISRO, over eager to announce launch dates, based on something they hear from within. It's the culture. Accept it, move on. I don't expect any better. Its not so simple they give a time line but when problems creep up or things need to be validated - would you jeopardize the whole program or delay till testing is completed ? These are things being developed and not things that are already in production- can you predict whether you will be alive tomorrow with uncertainty ? How will you be able to predict a complex system with high chances of failure with the slightest error ? The delay is acceptable with LVM-III but the fact that even GSLV-II gets pushed back is sad. Lets hope for successful launches anyway. I think with PSLV there is a lot more confidence in ISRO and GSLV-II should get there by 2018-19.
prasannasimha wrote: Its not so simple they give a time line but when problems creep up or things need to be validated - would you jeopardize the whole program or delay till testing is completed ? These are things being developed and not things that are already in production- can you predict whether you will be alive tomorrow with uncertainty ? How will you be able to predict a complex system with high chances of failure with the slightest error ? You do see the obvious logical fallacy here. How will you be able to predict a complex system with high chances of failure with the slightest error ? The same way they predicted a launch in December 2016. I am hoping to be at Sullurpet around the launch time and witness it. Can any one suggest any good vantage points? We had been hearing that since quite some years. But no progress. No mention in Budget doc. Mk2 is still experimental. Should not be confused with PSLV. These types of delays will happen with new systems. ISRO is not north Korea that it will test just for the heck of it. We will need to see timelines once MK2 is commercially operationalized. Even then you can face technical delays. ^ You missed the point - there is a higher inabity to give an accurate prediction in those systems. Good if it works out as per plan but there are so many ifs and buts against the best case scenario. I don't think they owe us explanations for the delays. But I am in the group of people who believe that they don't have to publish target dates and then go back on them. They can publish the date whenever they are absolutely sure. Indranil wrote: I don't think they owe us explanations for the delays. But I am in the group of people who believe that they don't have to publish target dates and then go back on them. They can publish the date whenever they are absolutely sure. Problem with publicly announced timelines is that in some people's mind that gets set in stone. People fail to see if timelines have changed due to various reasons, which may or may not be announced to the public. For complex projects, timelines will change more often than not. Estimation is not an exact science. There are many moving parts and any of them could cause delays to the overall. One may think certain thing is doable within x amount of time but only to realize that it's going to take a lot more time after digging in deeper. Every detail (and revisions) won't be announced to the public. IMO, ISRO/DRDO et al should not announce hard dates to the public. They should make it more cryptic by only announcing anticipated number of months/years for project completion and with caveats (i.e. provided following conditions are met etc). Good news guys. Launches are not far away. CHENNAI: Isro is planning three launches in May including GSLV MK-II carrying the South Asia Satellite and the first developmental flight of GSLV MK-III, capable of lifting a 4-tonne payload, said P V Venkitakrishnan, director, Isro Propulsion Complex on Tuesday. Speaking on the sidelines of the 58th Institute Day of IIT Madras, Venkitakrishnan said there would be at least a 25-day gap between GSLV MK-II, scheduled to be launched early in the month, and GSLV MK-III planned for the end of May. The time between the two launches will enable scientists to refurbish the stages, as both the rockets will take off from the same launch pad. Isro chairman Kiran Kumar had earlier said GSLV MK-II would be launched on May 5. PSLV C38 is also planned for next month, but the launch will happen depending on the priority and availability of the satellites, Venkitakrishnan said. "The vehicles are ready," he added. Expressing confidence over the success of the first developmental flight of GSLV MK-III powered by an indigenous cryogenic upper stage, Venkitakrishnan said they would have two more developmental flights to optimise its payload capacity before reaching the operational phase. "When we did the first stage test for 50 seconds on the cryogenic upper stage for MK-III, we did not face any problem. We did it right in the first go and I don't think there will be any problem in the first flight," he said. ^^^ If ISRO lofts both the GSLV marks in May, I will forgive ISRO for the PSLV launch slipping to June. National Fertilizers Ltd (NFL) will set up a production plant for dinitrogen tetroxide (N2O4) at its Vijaipur (Guna, Madhya Pradesh) site for ISRO (Indian Space Research Organisation) with an investment of Rs 350 crores. The company has received a letter of intent (LoI) from Satish Dhawan Space Centre, Sriharikota (SDSC-SHAR) for establishing the plant on build, own, operate & supply model. ISRO had invited tenders for establishing the dinitrogen tetroxide plant in August 2016. Nitrogen tetroxide is used as oxidiser in specific stages of rocket launch vehicles launched by ISRO and also used for ground testing of specific engines and stages of launch vehicles. Debt-ridden public sector undertaking (PSU) Hindustan Organic Chemicals Limited (HOCL) is the sole producer of N2O4 for ISRO. With N2O4 production continuing intermittently at HOCL, experts believe ISRO has been looking at setting up a new plant for assured supply of this key chemical. As per the LoI, National Fertilizers’ N2O4 plant will have capacity of around 1095 MT per annum (or 3 tonnes per day). The company plans to start construction work for the project in July 2017, with commissioning expected in the next 18 months. NFL will supply the product exclusively to SDSC-SHAR under long term agreement for 25 years period. arun wrote: ^^^ If ISRO lofts both the GSLV marks in May, I will forgive ISRO for the PSLV launch slipping to June. It’s official. The Indian Space Research Organisation (ISRO) has invited scientists to suggest studies for a potential orbiter mission to Venus - somewhat similar to the one that landed in Mars in 2013. ISRO plans to send a spacecraft that will initially go around Venus in an elliptical orbit before getting closer to the ‘Yellow Planet’. It will carry instruments weighing 175 kg and using 500W of power. The scientific community has been told to suggest space-based studies by May 19. "The Announcement of Opportunity [AO] is just the beginning. The studies must be finalised, a project report would have to be presented and approved. A formal mission may not happen before 2020," a senior ISRO official told The Hindu. A mission must be approved by ISRO's Advisory Committee on Space Sciences, then the Space Commission and later by the government. Venus, the second planet from the Sun, comes closest to Earth roughly every 583 days, or about 19 months. Venus, our closest planetary neighbour, is similar to Earth in many aspects. However, it takes only 225 days to revolve around the Sun. Secondly, the surface is very hot due to nearness to the Sun. India's previous and second planetary outing, the record-setting Rs. 450-crore Mars Orbiter Mission (MOM) of 2013, continues to impress. The orbiter is going round the Red Planet even as you read this — well beyond its planned life of six months. An orbiter sent to the Moon in 2008 was delivering data until about three months before its estimated life span. A second Moon landing mission is planned in early 2018. Jingoes on this thread will wring their hands and do rona-dhona when launch of their fav. launcher is delayed. Jingoes on this thread will wring their hands and do rona-dhona when launch of airstrip construction is proposed but never undertaken. Jingoes on this thread will ALSO wring their hands and do rona-dhona when a launch fails. Point is - there is one constant - Jingoes on this thread will wring their hands and do rona-dhona. In a way., it is a good thing. At least we are expecting results from ISRO and the bar has been set so high. Unlike the days of ASLV where there were two launch failures consecutively and one had to wait for almost half a decade to get some good news. Launch delays can happen several reasons., and yes launch schedules can slip. Based on new information coming in. Based on discovery of some new protocols that may cause a future problem or mitigate a problem and that needs to be implemented. Launch delays can also happen because the launcher is ready but the payload is not. Or the payload is ready but the tracking system is not. Or everything is ready but the launch window is not available. Remember, for launching 100+ satellites ISRO had to manage several thousand variables. And each variable is a test point. We would not know the number of variables going into GSLV-MK III until we hear after launch comments. 2. Their launch coverage. It is: -1/10. 3. They did hear some jingoes on this thread (or so we can lead ourselves to believe) and put cameras on the launch. Still on the video coverage - I will give them 1/10. Where is the high speed color camera capturing every moment of the launch from countdown to ignition to clearing of tower to rise into stratosphere? 4. Increase in budget., RLV-TD needs to be scaled up and scaled up fast. It should be on a mission mode like GLSV-mkIII. Here ISRO gets 5/10. 1. They should have a ceremony where some coconuts are taken on a highly decorated bullock cart (A village is chosen from India to send its prized bulls and the bullock cart and they are sent in style - maybe on a AI flight) and the coconuts ceremoniously broken near the launch pad and coconut water sprinkled. 2. Every launch they should have a 5 minute segment on how "INSAT" saves the lives during cyclone followed by a morose like Jean Druze stating how spending money saving lives is such a waste for India's space program. This in interest of 'editorial' balance. 3. Show a video on rocket disasters across the world. Like the great cartwheels done by NASA and Russia and NoKo rockets and the famous rockets of cheen that exploded on villages. And then point out that space exploration is a very very very high risk business. Coming to "airport on sulurpeta"., sulurpeta comes under Gov. of AP and they can promote it as a tourist hub. It is their choice. And ISRO can have ex-ISRO personnel who can take the visitors on a guided tour around ISRO into non-sensitive areas. On the question of taking the 'delicate satellites' via truck., well CISF provides the security for all ISRO operations. At the same time, the sats are not so delicate that they cannot endure a truck ride. In fact., the ride to the space is not so smooth. All Sat buses have to go through the shake & bake test to qualify for a ride on to the launch. Speaking of road transportation of satellites, ISRO has taken care of road transportation issues by using a specially designed Satellite Transportation System (STS). ………………. The STS is built with a suspension cradle that attenuates shock, vibration and handling loads. Double walled thermally insulated, sealed encapsulation structure of STS shields satellite from climatic hazards such as temperature, humidity, contamination, rain, dust, differential pressure, etc. Robust all metallic Faraday’s cage design and low resistance electrical bonding of STS provides Electro Static Discharge (ESD) path and protection against RF radiation hazards. ……………. A Tentative path for GSLV F09 flight has been identified in the " Notice to Airmen " ( NOTAM ) bulletin. 3 points have been specified. ADVANCE THROUGH A SEPERATE NOTAM. PSLV C38 with 37 satellites ( Cartosat 2E being main payload ) is slated for 25th May Launch. X Posted from the “Indian Missiles and Munitions Discussion - June'14” thread. With Hydrobharat down for maintenance, an alternate website to track down NOTAMs. In the box on the left hand side of titled NOTAM Retrival select ICAO as “Report Format Type” and type VECF in the box captioned “Locations”. There is a NOTAM out for May 4 and May 5. May I Request a kind soul to do a distance calculation and box tracing on a map? In the box on the left hand side of titled NOTAM Retrival select ICAO as “Report Format Type” and type VOMF in the box captioned “Locations”. There is a NOTAM out for a ballon launch which I presume is for getting a handle on high altitude wind speeds for the upcomming GSLV launnch. SSSalvi wrote: PSLV C38 with 37 satellites ( Cartosat 2E being main payload ) is slated for 25th May Launch. Disappointed that it is not the GSLV Mark 3 aka LVM3. 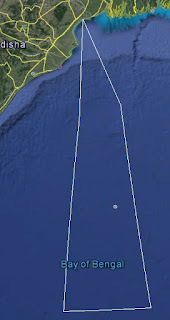 Hmmm …………….. “Experimental Flight Vehicle Launch” out of Shriharikota(?) for May 2 to May 3 as it is for VOMF Madras FIC. Does not look like the GSLV F09 as there is a separate NOTAM out for that launch. GSLV Mark 3 aka LVM3 launch afterall? A0802/17 (Issued for VOMF PART 1 OF 2) - GSLV-F09 ROCKET LAUNCH FM SHAR RANGE,SRIHARIKOTA WILL TAKE PLACE AS PER FLW DETAILS. THE LAUNCH WILL BE ON ANY ONE OF THE DAY DRG THIS PERIOD. ACTUAL DATE OF LAUNCH WILL BE INTIMATED 24HRS IN ADVANCE THROUGH A SEPERATE NOTAM. LAUNCH PAD COORD: 13 43.2N 080 13. 8E NO FLT IS PERMITTED OVER THE DNG ZONE. Could this notice be about the Pad Abort Test? Or some other missile launch? The co-ordinates describe an area marked in this figure. Could be a missile test from Chandipur on 2nd or 3rd. The cryogenic engine in Mark III is entirely designed in India, and is twice as powerful as the Mark II cryogenic engines. Isro has used a different technology for this engine called the gas-generator cycle, primarily because it gave the engineers the freedom to test each component separately. The earlier engine used a method called staged combustion, where the entire engine had to be tested as one entity. “We have now made about 200 tests on the engine and its components separately,” says Kiran Kumar. “Satellites are getting heavier and heavier,” says K Sivan, director of the Vikram Sarabhai Space Centre (VSSC) in Thiruvananthapuram. “So we have to increase the capacity of the vehicle.” GSLV Mark III can be tweaked to later to carry more than six tonnes of payload into a geostationary orbit, by replacing the core liquid stage with a semi-cryogenic engine. This engine is under development, and might take three to four years. After its development, India would be able to put six to seven tonne-class of satellites into a geostationary orbit, and stop using expensive overseas facilities for launching its communication satellites. This week's space mission, GSAT-9 or the South Asia Satellite, will carry a new feature that will eventually make advanced Indian spacecraft far lighter. It will even lower the cost of launches tangibly in the near future. The 2,195-kg GSAT-9, due to take off on a GSLV rocket on May 5, carries an electric propulsion or EP system. The hardware is a first on an Indian spacecraft. M.Annadurai, Director of the ISRO Satellite Centre, Bengaluru, explained its immediate and potential benefits: the satellite will be flying with around 80 kg of chemical fuel - or just about 25% of what it would have otherwise carried. Managing it for more than a decade in orbit will become cost efficient. In the long run, with the crucial weight factor coming down later even for sophisticated satellites, Indian Space Research Organisation can launch them on its upcoming heavy rockets instead of sending them to space on costly foreign boosters. Shortly, its own vehicle GSLV MkIII is due for its full test flight. Dr. Annadurai told The Hindu that GSAT-9's EPS would be used to keep its functions going when it reaches its final slot - which is roughly about two weeks after launch - and throughout its lifetime. Normally the 2,000-kg class INSAT/GSAT communication satellites take 200-300 kg of chemical propellants with them to space. The fuel is needed to keep them working in space, 36,000 km away, for 12 to 15 years. Dr. Annadurai said, "In this mission, we are trying EPS in a small way as a technology demonstrator. Now we have put a xenon-based EP primarily for in-orbit functions of the spacecraft. In the long run, it will be very efficient in correcting the [initial] transfer orbit after launch." He said that the space agency normally uses up 25-30 kg of fuel on the satellite each year to maintain its functions and orbit position. An EP system would vastly bring this amount down. A xenon based EPS can be five to six times more efficient than chemical-based propulsion on spacecraft and has many uses, according to Dr Annadurai, whose centre assembles all Indian spacecraft. A 3,500-kg EPS-based satellite, for example, can do the work of a conventional spacecraft weighing 5,000 kg, but cost far less. "One day, we should be able to launch a 5-tonne equivalent spacecraft - but weighing less than it - on our own GSLV [MkIII.] We are not yet there," he said. All this is on the way, may be in around three years. GSAT-20 is planned as the first fully EPS-enabled satellite; its features were not immediately available. ISAC and the Kerala-based Liquid Propulsion Systems Centre are lead centres in developing it. A trend that started about four years back, EPS is expected to drive half of all new spacecraft by 2020. For Space-dependent sectors across the globe, the economic benefits of EP systems are said to be immense. Currently government-owned and private space players agencies are said to be scrambling to make space missions 30 per cent cheaper than now - by lowering the per-kg cost of lifting payloads to specific distances. Gslv3 launch with perhaps last of imported cryigenic is imminent. Later this month first flight of gslv3 with indian crtogenic with ariane style single plane dual strap ons. 1st stage will ignite after 100secs of launch not for launch. GSLV Mk III is delayed because they were human rating it. I am searching for links., but if that is indeed the case - it is a major major major step. GSLV Mark-III set for first flight after Isro's Saarc satellite launch. The Indian Space Research Organisation (Isro) has finally come up with the third generation geostationary launch vehicle (GSLV Mark – III), which will help launch heavier payloads of over 4,000 kg into orbit and probably help India send humans into space for the first time. Isro successfully developed the GSLV Mark-III despite several constraints at its Sriharikota facility, including lack of space and components and the high cost of development. Isro is now readying the vehicle for its first full flight GSLV Mark - III at the end of this month, roughly three weeks after another flight of the current generation GSLV Mark -II, (GSLV-F0-9), on 5 May. The first flight of the launch vehicle - GSLV Mark III – will most likely at be the end of this month, after Isro places the Geosynchronous Satellite GSAT-9 (called the Saarc satellite) in orbit. GSAT-9 is a Geostationary Communication Satellite intended to provide various communication applications in Ku-band with coverage over South Asian countries. GSAT-9 is configured around the Isro's standard I-2K bus, with lift off mass of 2230 kg. The main structure of the satellite is cuboid in shape built around a central cylinder with a mission life of more than 12 years. GSLV-F09 mission is the eleventh flight of GSLV and its fourth consecutive flight with the indigenous Cryogenic Upper Stage (CUS). GSLV-F09 will be launched from the Second Launch Pad (SLP) at Satish Dhawan Space Centre SHAR (SDSC SHAR), Sriharikota. The GSLV Mark III is a complex vehicle and some of its critical technologies had to be developed from scratch. It has used new ideas in its design, manufacturing and this would be the first flight of GSLV III using India's fully-indigenous cryogenic engine. Isro's cryogenic engine development had hit hurdles and were delayed beyond reasonable measure. The first flight of GSLV Mark-III will be a developmental flight, which will also mark a major milestone for Isro, in which it will also be using India's cryogenic engine - a reengineered version of the Russian cryogenic engines. GSLV Mark III has a core liquid stage with twin engines, which is another design novelty. Isro, meanwhile, is reported to be ready with another ambitious plan to develop technology that will enable two separate spaceships to connect in orbit and reassign material, including human beings between them - a technology that can be used for putting human beings in space. Described as ''Spacecraft Docking & Berthing'', the new mission will not only revolutionise the existing technology of the Indian Space Research Organisation but also will revitalise the global space industry, by paving new paths for advanced deep space exploration programmes and manned missions. This new technology, developed by Isro will enable the agency to connect two space vehicles in the orbit and shipping material between them to space. The mission already has been sanctioned by the Department Of Space with a funding of Rs10 crore. The technology once developed fully, will eventually allow Isro to conduct manned missions to space. However, the immediate goal of the programme is to facilitate the replenishing of spacecraft to confer them an extended existence and transport other vital systems from earth to orbit more efficiently. Docking will help., but GSLV-III is human rated. What is human rating? It is not just putting humans on top of a rocket - but going through its complete failure analysis and building tolerances or exigencies around expected failures. For example what happens if the LM-Stage0 MkIII motor does not fire? Or the solid boosters develop lack of control? On Saturn V., pogo oscillations famous. Imagine riding a rocket which scrounges your innards! :-( https://en.wikipedia.org/wiki/Pogo_oscillation., this and various other aspects need to be covered for human rating.